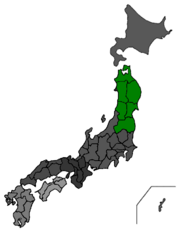 Tohoku (東北地方 Toohoku-chihoo) is a region of Japan located on Honshu island. It consists of six administrative areas (prefectures), and is home to the cities of Sendai, Akita and Aomori, among others. Tohoku comprises the northernmost region of Honshu, and is divided into six prefectures: Akita, Aomori, Fukushima, Iwate, Miyagi and Yamagata. The total population of the Tohoku region was 9,575,000 in 2006. In the Edo period gross migration numbers were high, but the net impact of internal migration was low. The primary reasons for leaving the village were marriage and employment, with few villagers moving more than ten kilometers away. Famines were a recurring problem. The new Meiji government, 1869-70, attempted to meet the great famine in Northeast Japan. To keep the defeated Northeast under control after the civil war, the government implemented various relief policies such as an embargo against feudal lords, the granting of a loan, and the transfer of government-owned rice. The government brought in great quantities of domestic rice, and the importation of Nanking rice. It emphasized strengthening national rule over the northeast after the famine such as the abolition of local inspectors, the streamlining of public administration, the appointment of agreeable men as local administrators, and the Sanriku Conference in the latter half of 1870. Another great famine hit the region in 1934. After it subsided agitation increased for a special development policy. The Seiyukai Party, which commanded an absolute majority of seats in the imperial diet, used the "rural issue," which included the problems of the Tohoku region, as a political weapon against the Okada cabinet, which was compelled to yield on this issue, leading to a Tohoku development policy. However, the abortive military coup d'état and the general election of February 1936 brought about the political undoing of the Seiyukai, and the conditions leading to the formulation of regional development policy radically changed. The goal of the Tohoku development policy changed to emphasize the exploitation of wartime resources. The outbreak of war between Japan and China in 1937 led to a further change in governmental policy toward the expansion of production, and the Tohoku development policy was changed again to reflect this overall shift in policy. Ultimately, the Tohoku development policy was subsumed within the new production expansion plan. ↑ Tohoku (東北町 Toohoku-machi) is also a town in Aomori prefecture. This page was last modified 04:19, 15 September 2013.